This 10 percent fenben-dazole oral suspension controls lung worms, stomach worms, and intestinal worms. 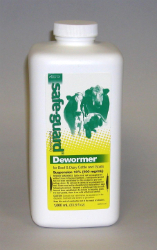 Safe-guard features no milk withholding and is safe for pregnant cows, breeding stock, and stressed cattle. For beef & dairy cattle and goats. The recommended dose of 5 mg/kg is achieved when 2.3 ml of the drug are given for each 100 lb body weight.